A couple of days ago, I posted Soon to be Expert ( ??? ) on a project I was starting on. 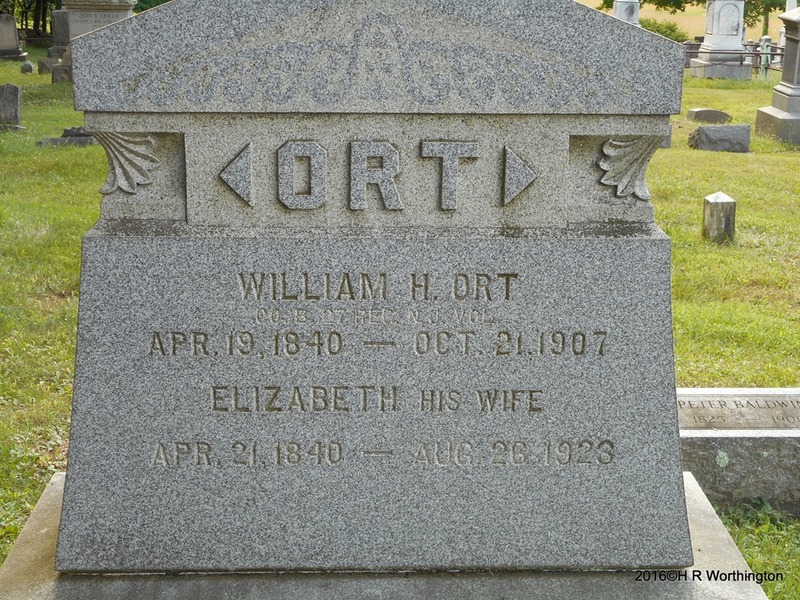 Being the 4th of July, I was drawn to take a look at the Civil War record of William H Ort, the Great Great grandfather of my daughter’s boss. The Soldier and Sailors website has information on the Regiments in the Civil War so I wanted to look a little more into this regiment to see if there were any battles what other Civil War units that I have looked at before. So, why am I posting this today. Well, I missed an anniversary, by two days. 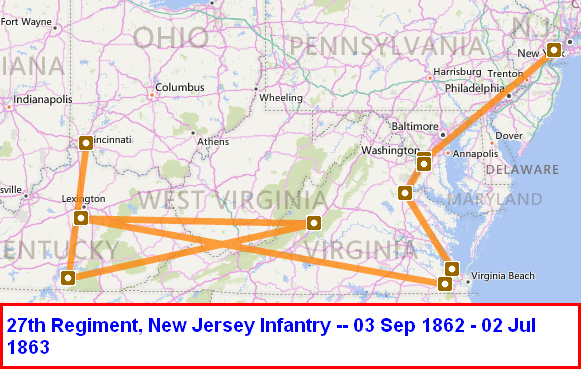 On 02 July 1863, the 27th Regiment was mustered out back in New Jersey. Guess I spent too my time in Cemeteries over the past couple of days. A Timeline Report is here if you care to look at it. Russ Worthington photograph; privately held by Russ Worthington, Hackettstown, New Jersey 07840, 2016. 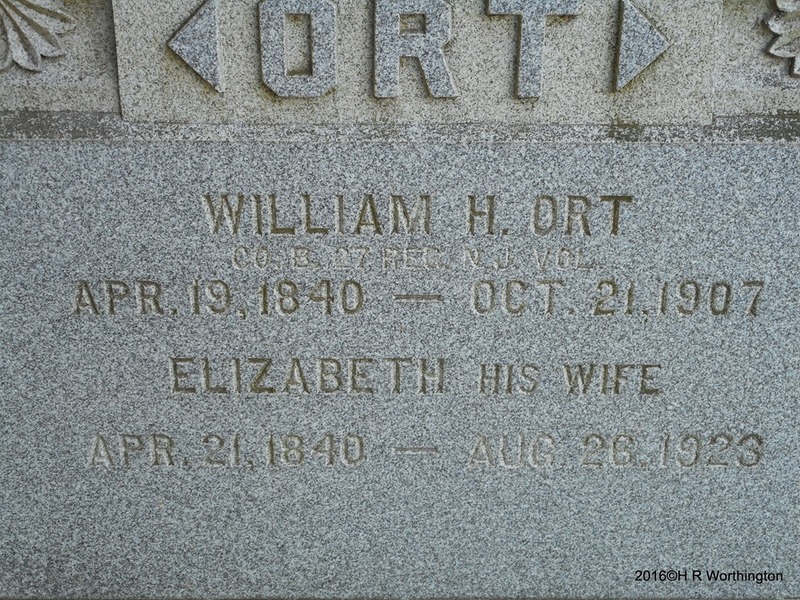 Headstone Photograph for William H Ort in the Pleasant Grove Presbyterian Churchyard, Pleasant Grove, Morris County, New Jersey. Hello, this is an old thread so I have no clue if any of you will respond, however I’m back tracking my grand mother Ruth Elizabeth Worthington’s family heritage. Apparently we have Native American in our blood thanks to a possibly a descendant of Virginia, a general as my dad heard. But now most of all the Worthington relatives are dead from the side of the Native American blood. I’m not sure if any of you guys know anything about it but email me keishafoulke@gmail.comif you have a clue, thanks. Below was in a comment on a blog post here and am hoping some of the readers may be able to help Sharon out. My Sarah R. Howard was born around 1794 in Scott County, Kentucky, which is where Georgetown, Ky is located, outside of Lexington. She married Lyman Merriman and moved with him to central Illinois, where they are buried. Because the Scott Co. courthouse burned twice in the 1800s, there are not many records. When I’ve googled “Howard” + Scott County KY”, the only Howard I’ve found is John Howard, John B. Howard, and John Bazel Howard. John was listed as John B. Howard and John Bazel Howard on two early Scott Co Ky censuses. I think it was 1800 and 1820. He witnessed a will of a MD native (who was part of the Catholic immigration into that part of Ky) around 1808 or 1810 as “John Howard”, if I remember correctly. I didn’t know if “Bazel” was a misspelling of Basil, or if it was a family name associated with the Howard family that was given to him as his middle name. Are you familiar with any Bazel family members who may have married into either the MD or VA Howard families? I’ve found people in MD with the Bazel surname and probably need to research the Bazel family to see if I find any intermarriage with the Howards. My assumptions, which could be wrong, are that John Bazel Howard immigrated to Ky with part of the 65 or so Catholic families from MD who agreed to settle in Kentucky. Part settled in Nelson Co Ky below Louisville, and part of the group who didn’t like Nelson Co settled instead in Scott Co, outside of Lexington. I assume that Sarah R Howard was John Bazel Howard’s daughter. I have no record of him moving to central Illinois, when Sarah “Sally” left Scott Co. with her husband and his family. in the early 1830s. 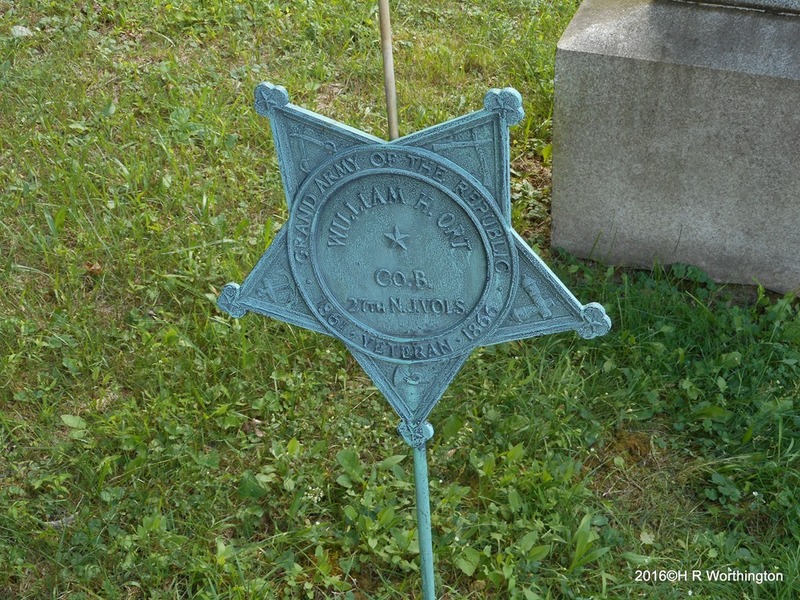 I did once find a John B. Howard in Butler Co., Ky, (I think around 1840 or so). Butler Co is 150 mi. southwest of Scott Co. I didn’t see an age for that John B Howard. I’m hoping this will ring a bell, or that you will eventually stumble across something in all your Howard research that might provide a clue or two. Would love to see your Howard ancestors and their dates/locations listed, sometime. In Inferential Genealogy Study Group in 2nd Life – Search Broadly #7 I mentioned that I had found some Civil War records. Have only heard about them, but not seen them. Up until today, no matter where I looked, I could not find David Ridgely Howard anywhere related to the Civil War. I was beginning to question if everyone in the Civil War would be found in the Civil War records. The fact that I have seen two indications that he had been wounded, not once but, twice, I thought for sure I would find something. Well I did. 20 pages of documents on Footnote.com. He enlisted August 21, 1862 in Richmond, Virginia by Capt R. B Winder for “3 yrs or war”. 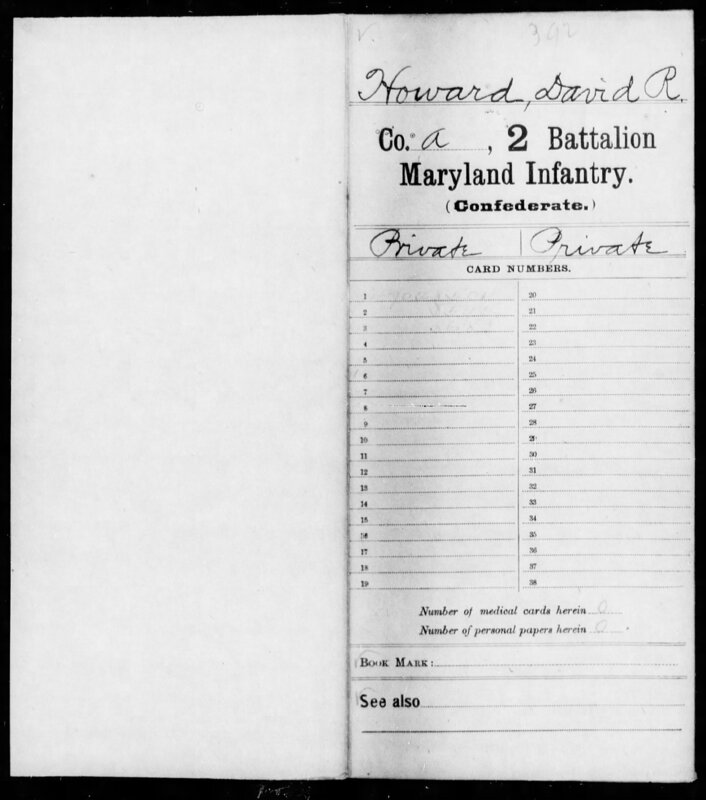 Company Muster Rolls were included, including “Sep & Oct, 1864”. He was absent with remarks of “Wounded on Weldon R.R. Aug 19, 1864”. This confirms one wounding that I have found. Then there were three Hospital Muster Rolls, so I can follow him through the hospitals. Then there was the Medical Directors Office record. “Aug, 19, 1864 – vs flesh upper ext portion left thigh” and was put on furlough for 60 days. The next record told us why. “G.S. amputation right lef flesh upper est portion of thigh”. Back to the books that I have picked up and waiting arrival to find the story of how he got from Baltimore to Washington, and now to Richmond. My Civil War re-enactor friend gave me some hints and hoping that one of this sources helps fill in the blanks. Lots of data entry into my genealogy software. Am working on creating his Civil War Timeline that are now documented by these Civil War Pension files.